People who think of new ideas for TV shows, movies and webisodes come from many different places and backgrounds. Many do not even work in the entertainment industry- they are just everyday people with an idea. 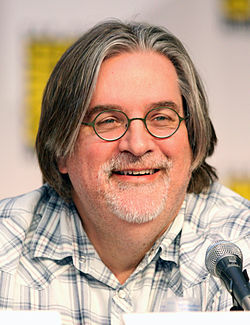 Matthew Groening, the creator of The Simpsons, was born on February 15, 1954 in Portland, Oregon. His mother was a teacher and his father was an advertiser and writer. Groening grew up in Portland and attended Ainsworth Elementary School and Lincoln High School. He then attended Evergreen State College in Olympia, Washington, a liberal arts college that was not like most traditional colleges. Groening calls it a “hippie college” because it did not have grades and class requirements. While attending the college, he was the editor of the campus newspaper, The Cooper Point Journal. In 1977, at 23 years old, Groening moved to Los Angeles to become a writer. He claimed that he went through a series of “lousy jobs,” including being an extra in the television movie When Every Day Was the Fourth of July. He was also a busser, dishwasher, landscaper and chauffeur for a retired Western director. Groening became employed at the Los Angeles Reade delivering papers, typesetting, editing and answering phones. Here, he showed his cartoons to the editor, James Vowell, who gave him a spot in the paper. He called his comic Life in Hell, which made its official debut as a comic strip in the Reader on April 25, 1980. Life in Hell became a quick hit, so much that it caught the eye of Hollywood writer/producer and Gracie Films founder James L. Brooks. Brooks contacted Groening about a position in animation. Groening came up with the idea for The Simpsons in the lobby of Brooks’ office, which included Homer, the overweight father; Marge, the slim mother; Bart, the bratty oldest child; Lisa, the intelligent middle child; and Maggie, the baby. He mainly named The Simpsons characters after the members of his family with an exception of himself. After successful years with The Simpsons and a few years researching science fiction, Groening co-created Futurama with David X. Cohen. After four years on the air, the show was canceled by Fox. After high DVD sales and great rerun ratings, the show came back for new episodes through the year 2013. Groening has been nominated for 25 Emmy Awards and has won twelve of them. Groening also received the National Cartoonist Society Reuben Award and was the British Comedy Award for outstanding contribution to comedy in 2004. He was ranked fourth in a list of the “top 100 living geniuses” and was nothing but a middle child from Portland, Oregon before obtaining all this magnificence. Anyone can make a TV show, movie or webisode concept presentation package with New Show Studios. You do not need and special credentials, background or a college degree to pursue an idea. As long as you have a clear idea of what your basic idea is and you are able to verbalize this, New Show Studios is happy to help. This entry was posted in Blog and tagged bart simpson, homer simpson, matt groening, new show studios, the simpsons, tv show ideas, tv writer by newshowstudios. Bookmark the permalink.